I’m not going to perform my usual summary here, as this story is so well know from both this issue and it’s adaption as an animated episode. Instead I just wanted to comment on a few things. Dini’s script hits on all cylinders. 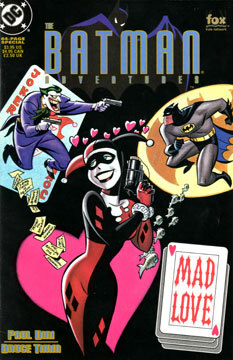 He weaves the origin of Harley into the Batman mythos as if she’d been around for decades. Reading this years later, it’s easy to see why it’s an award-winning issue. It’s fun to se some of the differences between this issue and the episode it became. This was published during the height of “Batman: The Animated Series” being on the air, just after “Mask of the Phantasm” was in theatres. Yet Montoya has already been promoted to detective. Harley’s anniversary outfit is a little more revealing. And some of the dialogue is slightly different. I enjoy seeing how a great script could become even more polished as an episode. Bruce Timm: Unfiltered. It doesn’t get any better. His style is looser than Parobeck’s, of course, but that simply adds to the animated feel. Reading this is not too far from looking at storyboards for an animated episode. This is 100% in continuity! And there’s still room for more.